Role-playing game lovers also tend to have a deep fondness for quality music. 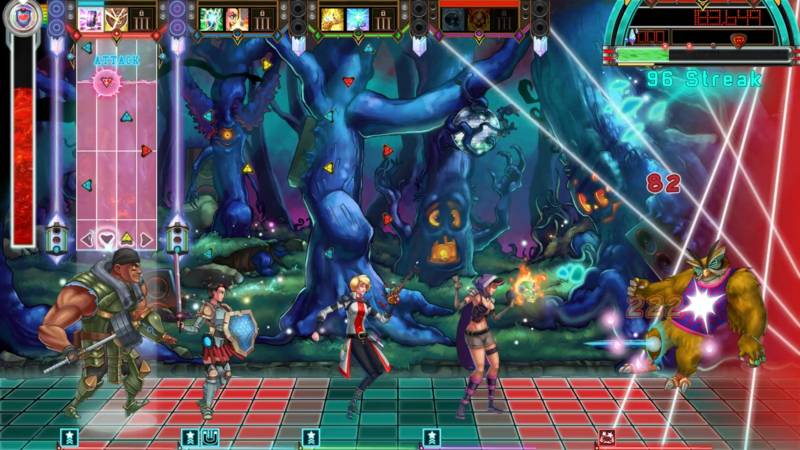 The Metronomicon‘s mix of DDR-style rhythm gaming note tracks and multi-tier active turn-based RPG spell-casting make it a game with no shortage of depth in both its dancing-inspired or JRPG-reminiscent parts. 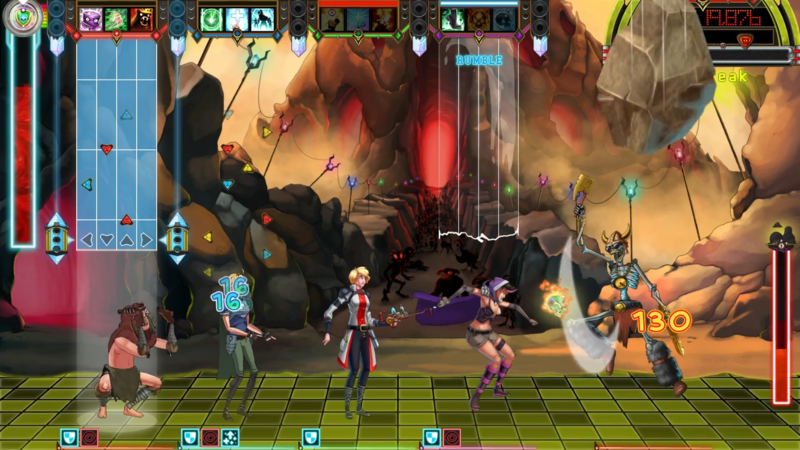 Metronomicon mostly sees players fighting gauntlets of enemies, one at a time, in survival style RPG battles where strategy and rhythm are equally important. It’s a pleasant and clever mix of genres. Taking some time out of his E3, developer Puuba’s Studio Lead Danny Garfield sat down and laid out the surprisingly complex mechanics that make his team’s new indie RPG work, as well as some first looks at never-before-seen content. The game’s story sees a once-peaceful land ravaged by mysterious, magical dance parties, raves, and ragers that have crashed down sporadically across the world. These parties, with their loud, entrancing music and sick beats, attract monsters who party so hard that they destroy and conquer their surrounding venues in the process. In response, heroes gather from across the land upon discovering that they too can harness the power of music to cast great spells through the mystical language of dance. These heroes compose the player-controlled militaristic, dance party response force called The Neon Shield. The player-controlled party composes of four recently graduated members of the Neon Shield, with each one being a specific class ranging from things like Cleric to the red mage-style Labcoat. 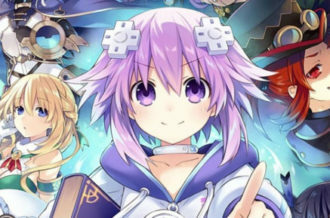 During battle, each class has their own note track, which the player will need to switch to and complete up to specifically marked notes to make the character in question cast one of three equipped spells or abilities. Each class will have relevant primary active abilities specific their classes, but also more passive secondary abilities that will activate at specific triggers. These all tie into the rhythm gaming elements very organically, but due to the tactical nature of the design, much of how the abilities interact with the note tracks depend on the player. For example, a Cleric can equip their Heal ability to one of three spell tier slots. Each tier has a corresponding, color-coded note track section which needs to be completed beat-matching, rhythm game style, to cast the spell equipped in that tier. Now, since there are three tiers and three different colored sections to the tracks, players need to complete all three note sections in the track to cast a third tier-equipped, level 3 spell. Likewise, players need only complete the first note track section to cast a first tier-equipped, level 1 spell. The effectiveness of the spell itself is determined by the tier it is placed in. So if a Cleric has their Heal spell placed in the third tier slot, it will take longer to cast, but heal much more when activated. Missing a note on the first tier section of a track will incur an HP penalty and start the note track over for the character. But if a player is working through the second and third tier of a note track and makes a mistake, the spell of the previous tier will be cast with a buff proportional to the progress made in the tier after it. In other words, maximizing the effectiveness of any ability equipped outside of the third tier means completing the note tier after it and purposefully stopping right before casting the next tier’s spell. Meanwhile, the secondary abilities can be similar to AI behavior settings. Each class can have one secondary ability, and these involve behaviors like attacking the enemy at every fiftieth note the player hits. There is a survival aspect to it as well, as the party all shares one HP bar, and battles often cycle through one enemy after the other until the song is over. Completing a dungeon and truly winning a fight is a matter of speed, rhythm, strategy, and adaptability, as it is possible to reach the end of the song – the end of the battle – before dropping the enemy. This is Metronomicon at its most basic level. 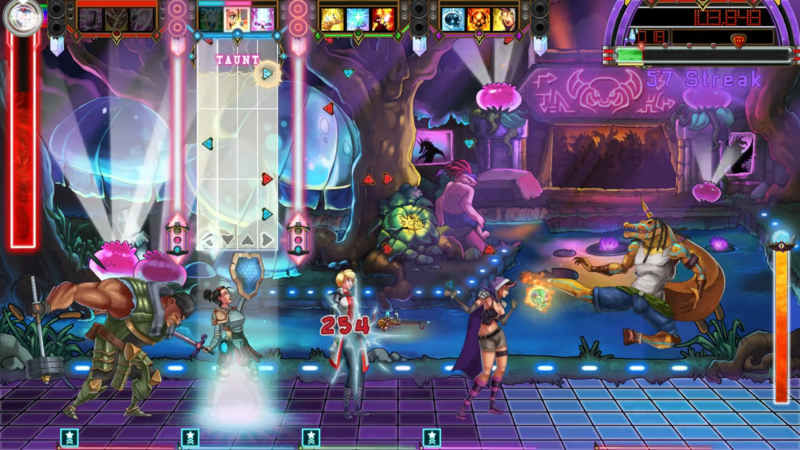 But as players get into the rhythm of matching the song, switching between character note lanes to cast different spells in specific sequences without missing a note, and responding to enemy attacks without skipping a beat, they will achieve some unprecedentedly strong party synergy and reach a skill level necessary to conquer the hardest difficulty. Needless to say, knowing what spells to place in which tier, planning activated team attacks, deciding which characters to bring in the party, and what equipment everyone should wear, are all factors players need to consider before setting out. 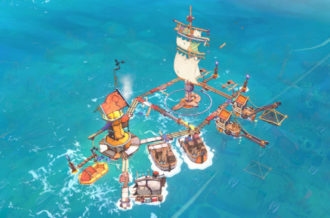 From the Neon Shield Academy grounds hub zone, players can shop for gear, reconfigure their party setup, and journey to different lands on the overworld map – which was shown during this meeting for the first time. Each region is essentially a replayable dungeon that scales to the player’s game progress. These play out like unlockable playlists, each with their own specific party style and music type. 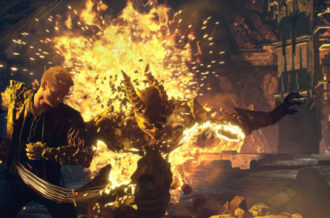 The story mode sees players fighting through different hand-choreographed songs, seeing voiced story cutscenes, and fighting against the clock – the song’s runtime – to kill the enemy monsters in time. Completing more songs in a region unlocks further songs, and further fights, in that region. Completing six songs in a region will give access to the boss. But that does not mean each region only has six songs, as bonus songs will allow players to earn additional experience and loot. 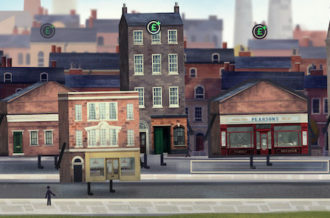 If a song ends before the last enemy falls, the player receives the rewards corresponding to their progress and will need to tackle the fight again. Boss encounters function differently, as most bosses will initialize different behaviors at certain parts of the song or at certain HP points, at times ducking out of the fight entirely. Different enemies have their own loot tables which contain percent chances per loot drop that are also affected by how well the player performs. The loot itself ranges from standard numeric equipment to more mystic gear that has special effects which trigger similarly to secondary abilities. 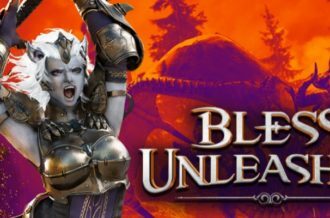 While even the easy difficulty is no pushover, perhaps partially due to the learning curve, players on higher difficulties may be inclined to go back to earlier dungeons and grind for better gear or hit the Arena. 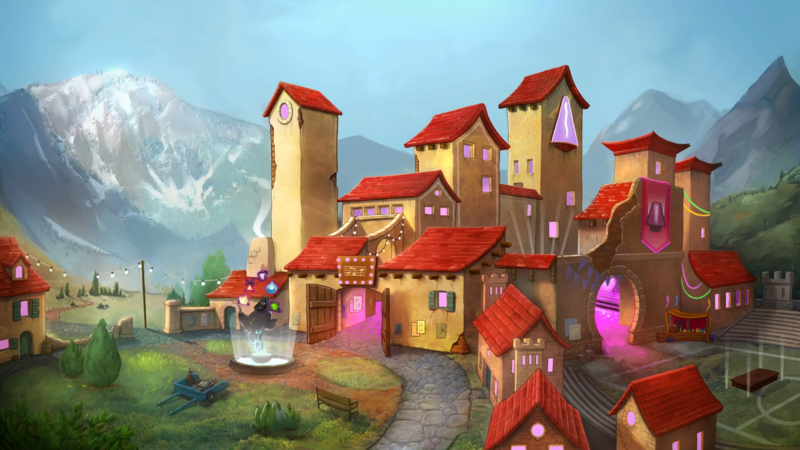 The Arena area will get newer challenges whenever the player finishes a region in the main story. The Arena challenges are essentially harder versions of previously unlocked songs with modifiers such as debuffs that never go away during the fight. There are also side quest versions of different songs which unlock after they are first beaten and are tied to online leaderboards. In fact, basically every song is scored and high scores, like any competent music game, are listed online and ranked. Now, the songs themselves range from licensed to original music, and even unreleased material. With a total of fifty songs, and DLC plans in the works to either add additional song packs or full story sections to go with the new songs, the library is already very promising. Fights even drop currency to use in a free listening room for those who just want to hear an unlocked song again. Finally, players who love just playing through the songs can pick the Free Play mode from the dynamically changing main menu and play through a list that would look familiar to any Rock Band or Guitar Hero veterans out there. 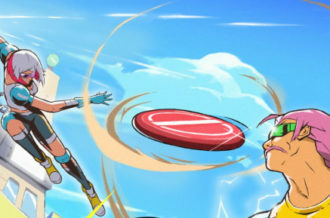 While this has only scratched the surface of what goes into Metronomicon‘s uncompromising mix between deeper RPG elements and rhythm gaming mechanics, an easy way to look at it is as an active turn-based RPG with rhythm gaming elements where the player’s ability to switch lanes and match the beat determines the turn and move order. Puuba have done an impressive job making what looks like an interesting game with a high skill ceiling, potentially doing justice to both the rhythm and RPG genres contained within. With a runtime of about 6 to 8 hours, music lovers will likely get the most out of The Metronomicon, but fans of tactical turn-based RPG mechanics will still have plenty to chew on as well during that playtime. It is hard to say, however, if fans of one genre or the other will be able to sit through the game’s challenges, as a proficiency in both gameplay styles is required to progress. Regardless, the true heights The Metronomicon will achieve with its genre-mixing won’t truly come to light until it releases on PC and Mac later this year.